A petition to charge Dianne Feinstein with treason that has gotten nearly 50,000 signatures is causing a bit of heartburn in Obama’s White House forcing team Obama to come to Di Fi’s defense. One of the somewhat silly things that team Obama did when it came to office was to set up a website where Americans could float petitions filled with ideas and issues that they want Obama to address. Now, in theory this idea sounds great. But in practice, Obama just ignores all these things. But they do offer an interesting story from time to time. A recent petition offers one of those stories. It is the petition to charge California Senator Dianne Feinstein with treason for her constant attacks on the U.S. Constitution, the Second Amendment in particular. The strength of the petition has caused Obama to come to Feinstein’s defense. Ah, schadenfreude. The anti-DiFi petition was created in December of last year and only five months later it had gained nearly 50,000 signatures. The fifty thousand mark is where Obama’s perpetual political campaign/White House staff have said that they will publicly address an issue directly. By the end of May the petition had 41,162 signatures. If you want to sign, see the petition HERE. Anyway, even though the petition has not quite hit the 50 Thou mark, team Obama felt compelled to answer to DiFi’s critics. We don’t believe that Senator Dianne Feinstein should be punished for championing legislation. In fact, we’re going to continue to work with her and other likeminded Members of Congress to put in place commonsense reforms to reduce gun violence. But we’re willing to have a reasonable debate about the steps we should take to make the country safer for our kids. And it actually seems like we’re starting from a place of common agreement: Like many of you, President Obama believes that the Second Amendment guarantees an individual right to bear arms. That’s never been in question with this discussion. What we’ve proposed are steps within the framework of that constitutional right to protect our communities from shootings and violence. If you want to see the specifics of our plan, you should visit WhiteHouse.gov/NowIsTheTime. Now generally, it’s up to our courts to resolve matters of constitutionality. But no less an authority than Justice Antonin Scalia has written, “Like most rights, the Second Amendment right is not unlimited. It is not a right to keep and carry any weapon whatsoever in any manner whatsoever and for whatever purpose” — so we’re pretty confident that we’re on solid ground when we say we support Senator Feinstein’s legislation to that effect. We also believe that there’s room for a civil discourse on matters of public policy — where we don’t try to silence our political opponents just because we disagree with them. In America, all of us, even those with whom you disagree, have the right to help to set our nation’s course. Which is exactly why we created the We the People platform. Even if you disagree with everything you just read, we want you to walk away from this process with knowledge that we’re doing our best to listen — even to our harshest critics. Apparently the White House feels that insulting our intelligence by claiming that Obama respects the Second Amendment and the U.S. Constitution is the way to go, eh? But, Obama is just as bad a liar and demagogue about guns as DiFi, so it shouldn’t be surprising that he is running to her support. It is also a bit disingenuous to claim that DiFi is just doing her duty as a lawmaker, too. She tried this failed gun ban business back in 1995 and dozens of times since. With as many times as she’s tried and failed to get the Second Amendment nullified with un-Constitutional federal laws one would think that her lawless agenda would be pretty clear by now. But, maybe I’m wrong? 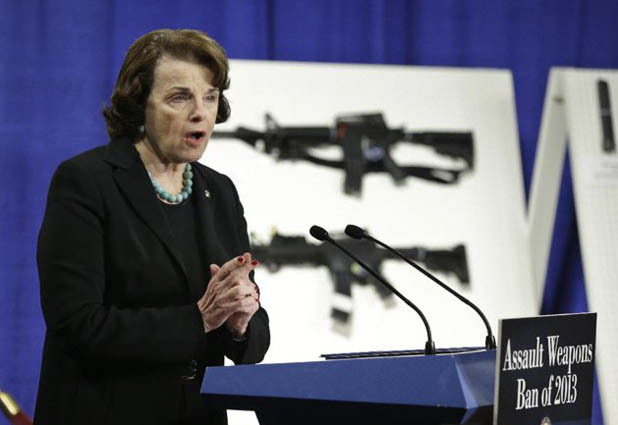 Is Dianne Feinstein just doing her duty? You tell me below. I find it strange that most petitions must reach 100,000 before the White House will comment. Time to put nanny Di in a home. People or Congress critters (some are not people) if they're going to try and change gun laws should (imo) know something about the subject. The Wicked Witch of the West has proved a number of times, she really doesn't know much about firearms. Other the scary black ones need her special attention. Her time in office should be curtailed for the good of America. Now if she wants to continue to screw California up thats up to them. Leave the rest of us alone! pretty much what the WH said was we hear what your saying but we just don't care. I'm certain the White House will do something about the petition to try Ms. Feinstein for treason right after they do something to deserve that Nobel Prize. It is time to force DiFi into retirement, and let her go back to San Fransico, and live out the rest of her miserable days! I don't know if that petition is shut down or what but I tried to sign and it appears closed to signatures. If they respond to the petition then it's closed. What it amounts to is that Justice Scalia was WRONG. If I had the money and the inclination I should be able to purchase a tank, an anti aircraft gun and surface to air missiles. I understand that maintenance on a tank is pretty expensive though, so I'll settle for groceries. South Carolina has 2 bills in the senate (not yet voted on) that basically say 1. no permits needed and only people prohibited by US Code (felons and crazy's etc.) will be restricted from firearm purchase or carry. 2. the Federal government cant f*^&% with our state law regarding this. Personally I have written my representative expressing my support for them. S0115 and S0316 if anyone else in SC wants to weigh in with their employees in the legislature. If you have the money, you CAN purchase a tank or an anti-aircraft gun or a military jet or helicopter. Shoot, with enough money, you could probably purchase a battleship, aircraft carrier, or boomer. The missiles are probably a little more difficult to come by. Likewise, if you have the extra money for the tax stamps, you can purchase full auto firearms. This is where the average American doesn't have a clue (and doesn't WANT a clue, either), and has bought in to the mantra that private citizens can't own these things. It really is possible for citizens to own many of the same weapons and weapons systems available to the military. It just requires more money than most of us here will ever have. I'd be happy with an MRAD and a model 82A1 in 416 Barrett.